Firm Ground (FG) or Molded - These are built for most firm natural surfaces. They use molded studs to provide traction on most pitches and are by far the most popular and versatile outsole for natural surfaces. Molded boots feature both conical and bladed studs. Soft Ground (SG) or Replaceable - For soft or wet natural surfaces (i.e. well-groomed pitches or mud). 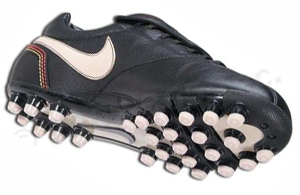 Traditionally, soft ground/replaceable have used fewer well-spaced, longer replaceable studs, however many now have bladed studs that are not actually removable. They are the choice for many professional players on manicured pitches, but are not ideal for most American fields because the firmness of the pitch. If used on pitches that are too hard, they can create stud pressure pain and lead to injury. Hard Ground (HG) or MultiGround (MG) - Created for artificial or hard natural surfaces like artificial turf or solid, sun-baked ground. Hard ground soccer cleats generally have a large number of short studs that are usually evenly distributed across the entire outsole. They also provide a good option on frozen fields and make a great backup pair for most players. 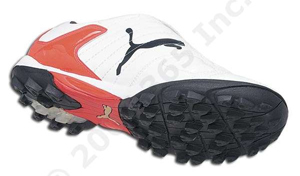 Turf - Turf shoes or turf boots usually feature an extremely durable rubber outsole. Turf shoes often feature small rubber studs or patterns on the outsole to improve traction on hard, natural fields and artificial turf. 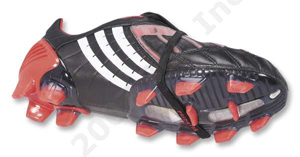 Turf boots are also great for soccer training and can be used as a back up pair of shoes for play on hard surfaces. Indoor - As the name suggests, for indoor or dry artificial surfaces. 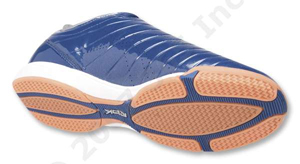 An indoor soccer shoe will generally feature a gum rubber flat outsole. They are created for playing indoor soccer or futsal in a gym or rec facility, but will also work for leisure and street wear. Often referred to as flats, indoor boots generally have a non-marking rubber sole. Simply stated, the upper is the part of the shoe that contacts the ball. Uppers are made out of a variety of different natural and synthetic leathers. Both offer a wide range of feel and durability. The softer the leather, the better the touch. Unfortunately, the best touch often means lesser durability. Another factor to consider is water retention; many soft, natural leathers absorb water when playing on a wet pitch. Many coatings and treatments are also available on the upper. They are designed to create friction for control, create a swerve on well-struck balls, or prevent water retention. Kangaroo: Kangaroo leather is a soft leather that stretches and molds to the foot. It is the most expensive and results in a pricier boot. It is lightweight and high quality. Shoes made of Kangaroo leather are the most comfortable you will own, however you sacrifice some durability and shoes made of Kangaroo leather usually will not last very long. Calfskin /Full-Grain: Calfskin is not supple like kangaroo leather but it is much more durable. It is heavier that kangaroo and will not stretch as much. However it is tough and boots made of calfskin usually fall into the mid-price range. Pittards Leather: Pittards leather is only used in Puma shoes. It is calfskin leather that has gone through a patented treatment process. This process gives the leather a water-resistant quality and causes the boot to dry faster. It also retains its softness and stretches less. Shoes made with pittards leather usually fall somewhere in between shoes of Kangaroo and Calfskin in terms of price. Running and training shoes for general fitness are a staple for any player. Generally, running shoes feature rubber outsole and nylon uppers. 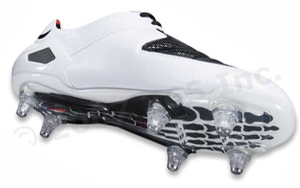 Some soccer trainers now offer a soccer upper and a running shoe outsole. Trail shoes are built like most other running shoes, but have a heavier outsole, and should be able to take heavier use. Sandals are key for many soccer players. These rubber slides offer some much-needed relief after 90 minutes in a match or intense training. The primary factor determining the price of a boot is the quality of the leather used in construction. The amount of technology that goes into a shoe also has an influence on its price. Many boot technologies and their definitions can be found in the technology glossary. The higher level the player generally the more money he or she will invest in boots. Boots should fit snugly in the heel and the toe ­ a snug fit improves both performance and comfort. A comfortable width is important, as well. Comfort is your driving factor, the more natural the boots feel on your feet the more comfortable you'll be on the field. The width and feel of shoes (dependant upon the last, which the shoe was molded on) varies with manufacturers and models. Keep in mind the material of the shoe in determining fit ­ you can expect high-quality, natural leathers to stretch some. Therefore they should definitely be snug when new. As a note to parents of junior players: We do not recommend buying shoes too large for players to "grow into." An overly large or poorly fitting shoe can contribute to accidents or injury as players push themselves to their limits. After you finish a training session or match, you'll want to prepare your boots for their next wearing. Taking care of your boots improves their performance and wearable life. Immediately after play, lightly knock any excessive mud and dirt off your boots. This is important because mud can draw moisture out of the leather and ruin it. When you get your boots home, make sure they are dry. To properly dry them, fill them with newspaper, taking care not to overstuff them, and place them in a cool, dry place out of direct sunlight. When shoes are heat-dried they can dry out, stiffen, and age prematurely (dry rot). After they are dry make sure they are clean by brushing and wiping them inside and out. Use an old toothbrush to remove dirt caked into crevices. You can also try the Kleen Kleat, which works great on most boots. Once dry, natural leather boots should be treated with a conditioner to help prolong their life. Store your boots in a breathable shoe or all-purpose bag - but never in a plastic bag, which traps moisture. purchased at World Soccer Shop, click here.